For my birthday in May, Dr Moss booked me onto a bread making course at the Harborne Food School. The Food School opened a year or so ago right next to our favourite coffee shop, and the course list offers a wide variety of classes for all ability levels and areas of interest. And so it was inevitable that we would eventually start taking classes there. 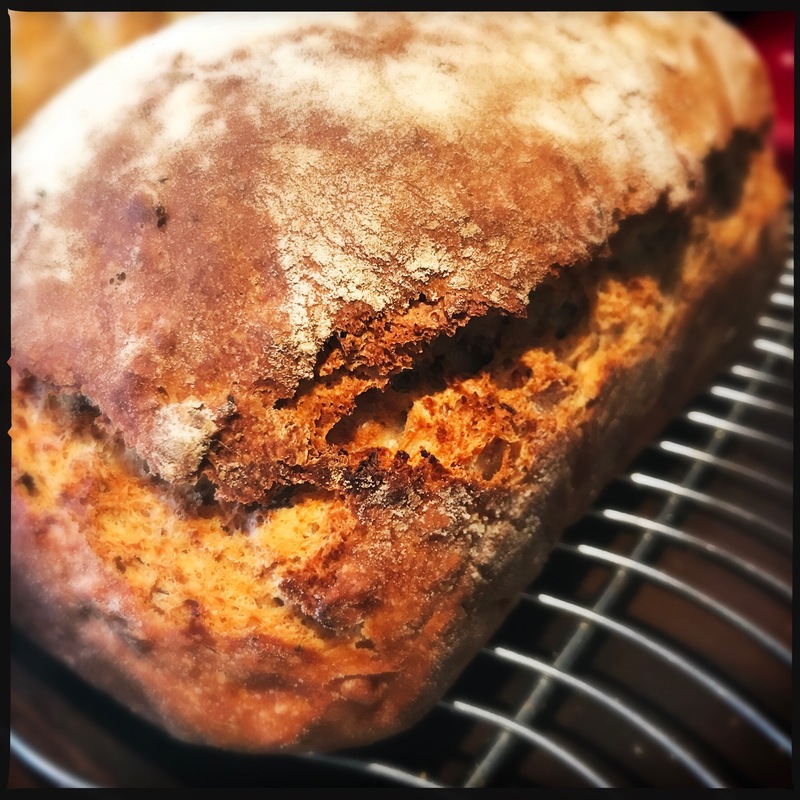 Despite baking quite a bit (at least before The Apprentice was born – there hasn’t been a huge amount of free time since) I’ve never made bread by hand. Given family history (more of which further down in this blog post) this is an omission I’ve long wanted to address, but haven’t really had the opportunity. 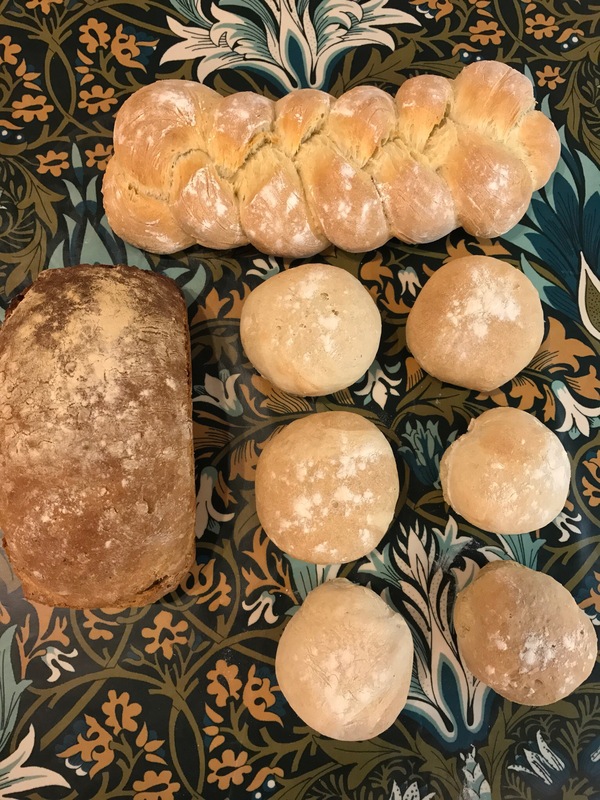 The bread making class took place in July, and was a wonderful (and educational) evening in which the processes and mechanics of making high quality bread by hand were laid bare in an accessible and very enjoyable format. Which is all very well and good you say, but what exactly does this have to do with woodwork? At first blush not a great deal, but this class set some ideas in motion which have been slowly coalescing and bouncing round my mind ever since. But first, the class itself. Over the course of three hours we were instructed in how to make white and wholemeal loaves entirely by hand. Two batches of white dough were turned into a plaited loaf and batch rolls, while the wholemeal was baked into a loaf for slicing. As a final task we made pizza dough for cooking an in-class dinner, chatting about cooking and the best kept secrets of Birmingham’s restaurant scene while eating pizza we’d made ourselves and waiting for our bread to cool from the oven. The camaraderie and shared passion for food created a wonderful atmosphere, and instructor Charlotte gave very clear instructions and explations for the techniques and methods demonstrated. When it comes to traditional crafts there really is no substitute for hands on learning, and this was the perfect introduction to something I’ve wanted to try my hand at for as long as I can remember. I’m now on the waiting list for Advanced Breadmaking (focaccia and ciabatta ahoy! ), and one of the very first things I did after the course was to book the Good Doctor onto a sushi making class for later this month. I fully expect that we’ll both be taking many more classes at the Harborne Food School over the coming years. 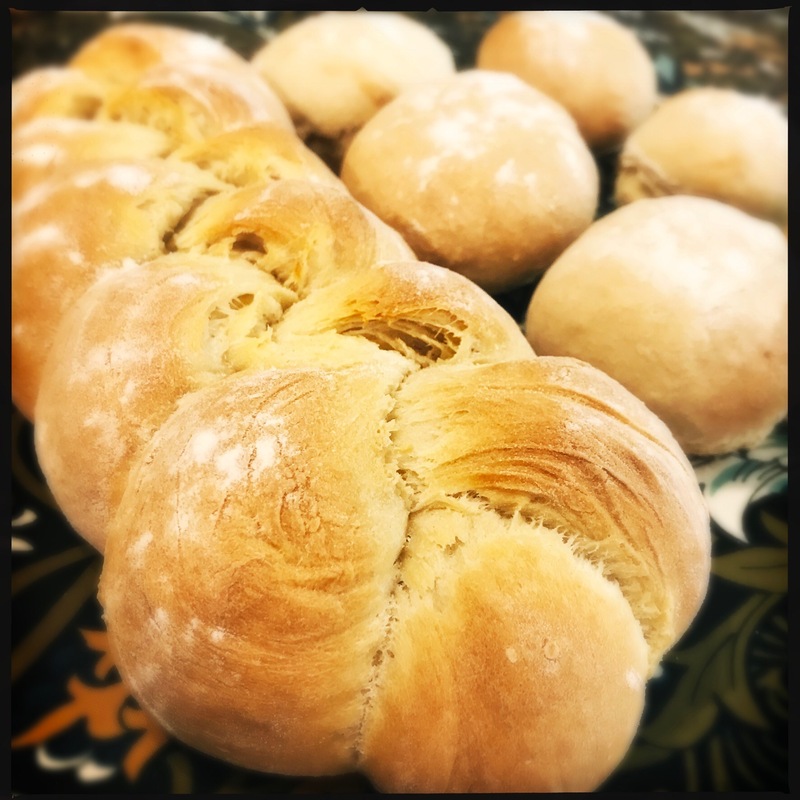 At some point during the class, as kneading the dough created a hypnotic rhythm, I started to reflect on the similar threads that link breadmaking to woodwork. It is, unsurprisingly, all about heritage. Heritage in terms of both skills and family history. Maple, not dough. But the process of taking a gossamer full-width saving is surprisingly similar to that for kneading delicious bread. Kneading that dough by hand, shaping it, and then baking until properly cooked, reminded me a lot of the time I spend at my workbench. 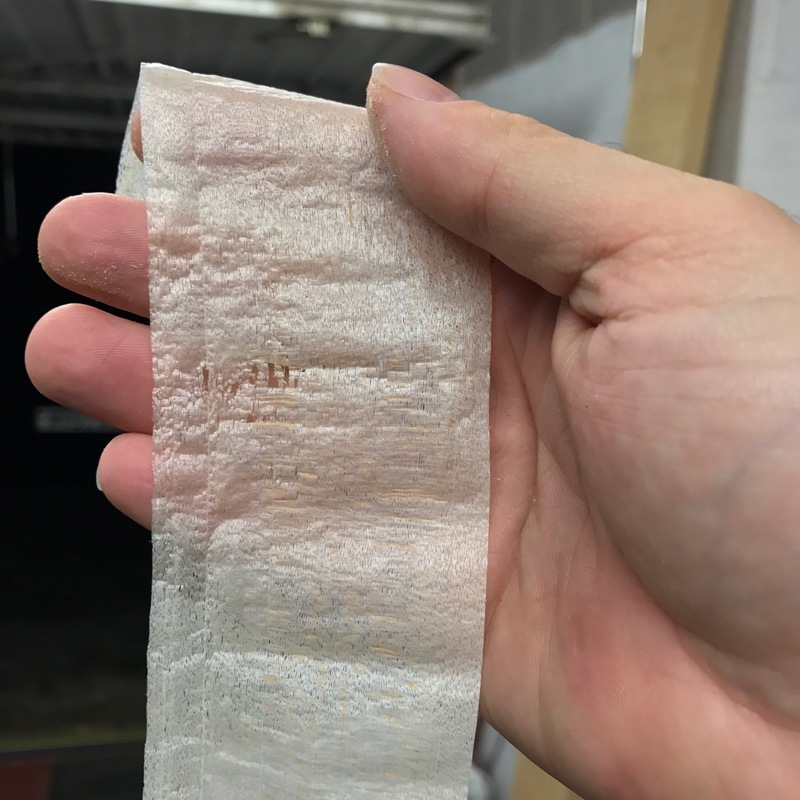 The proximity you gain to your material by working by hand, without machines acting as intermediaries, gives rise to an understanding of how the material is being worked, and when it is ready. Touch and feel tell you as much (sometimes more) than your eyes, and the process becomes one of thinking with your fingers as well as your mind. The more time I spend at my workbench the more I think that this state is where I am most truly content – working with a combination of both hand and mind to arrive at something useful that I have fashioned myself out of basic raw materials. There is also a sense of self-reliance common to both woodwork and cooking. Sure, you can buy bread readily and cheaply. But the act of choosing to make it yourself out of good quality ingredients (free from the multitude of artificial elements found in commercial bread) speaks, I believe, to the same sense of aesthetic anarchism that motivates many of us to build the furniture we need. A small act of refusing to be someone else’s consumer, and to make the things we need. Maybe I’m over-playing this a little, but I still get the delicious bread at the end of it, so either way I win something. Using those same traditional techniques to knead and bake the bread I found also brought me one step closer to my grandfather, and to the heritage of his chosen craft. I’ve written about my grandfather before (also here). When I was growing up he was the main woodworking example I had to look up to. But he was also a third generation master baker. If you read local history books about Birmingham in the nineteenth and twentieth century, many of them will mention T Mountford and Son, a bake house found on the Lichfield Road at the junction with Sutherland Street. That was the bakery started by my great-great-grandfather, at which three generations worked. My grandfather had left school at 14 to work in the bake house, and continued to do so until the shop closed in the 70’s (due, I believe to a compulsory purchase order by the council to widen the Lichfield Road). Even in his 80s, my grandfather had the strongest hands of anyone I’ve ever known, from a lifetime of kneading dough. And so during that hypnotic slap-stretch-roll of kneading the dough at the Harborne Food School, I found a wonderful sense of peace, and feeling that I was working as my grandfather had, not to mention the earlier and generations I’d never known, very much as I do when I’m at my workbench. Although traditional bread making doesn’t really translate to how I approach my workbench, that sense of self reliance and continuation of traditional skills in order to create things of use, is incredibly powerful. And it is a mindset that influences an increasing amount of my life. This entry was posted in parallel skills by overthewireless. Bookmark the permalink. What a great story. Thank you so much for sharing. Glad you enjoyed! Thanks for taking the time to read and comment. Thanks Marthe! I thought you’d understand where I was headed with this post. I grew up hearing my grandfather’s stories about working in the bake house – how the local beat bobby always used to check in when the lardy cakes were coming out of the oven, how the last hot cross bun he made every Easter would be put on a nail for a year, and how they’d bake some 15,000 mince pies in addition to the regular bread and cakes every Christmas. I have the original bake house recipe books on my shelves, although they need downscaling for domestic use (some recipes call for a bushel of flour!). These stories, and the experience, feel woven through my childhood, even though the bake house had closed before I was born, and I find myself reflecting on them more and more. I used to think of aesthetic anarchism just in terms of my woodwork, but it is becoming increasingly important in many other aspects of my life, and in. The example I want to set for the Apprentice. There is much more to explore and uncover here, and I’m really glad that you’ll be coming along for the ride. Hopefully we’ll get to craft together sometime! Lovely post and absolutely divine looking loaves (buns too). YUM. Thanks Nancy! Anytime you’re visiting in the U.K. There will be freshly baked bread waiting for you.